New project! A truly self-watering container garden. Just as soon as the weather cools, we can plant our fall vegetable container garden . With our new found knowledge, we'll make it truly self-watering and protected from any hot weather that could return. It's a fairly big job to set this system up, but if it works, it should make this kind of gardening much less labor intensive. "Less labor" is my motto. You can follow our progress if you want, to see how it plays out. Once you see that it works, you may want to visit Easiest Garden for more detailed plans. I'll post our attempts using the information we obtained from them without infringing on their rights. I'm sure they won't mind. Here's a pic of the control bucket. It's covered with the insulating foil I mentioned in the previous post. This is the same material we plan to cover our actual vegetable container pots to insulate the plant roots. If you're in cooler zones, you may not have to do this. But, at least in zones 8-9, it's probably a must. If you are becoming interested in this vegetable watering system, there is a DVD on the Easiest Garden site. We're not affiliated with this site in any way, we are just passing on useful information we have found and are going to experiment with. I hope they are thrilled with the referrals, I know I would be. You set up a 55 gallon drum filled with water. This drum is your main water source. This water feeds into the above control bucket, which is equipped with the floater that sets the water depth you want in your vegetable containers. A line feeds out from the control bucket into lines that feed each container. All your vegetable containers receive the exact amount your determine and no more. Any excess from rain flows out a relief hole in the containers, so your roots won't drown. All you have to do is make sure the larger, 55 gallon drum reservoir is full. Not an every day occurrence. You do not have to tend to, check or otherwise bother with the watering of your vegetable container pots. They will be truly "self-watering"
Self-Watering Container Garden : Follow our first attempts at this kind of gardening. 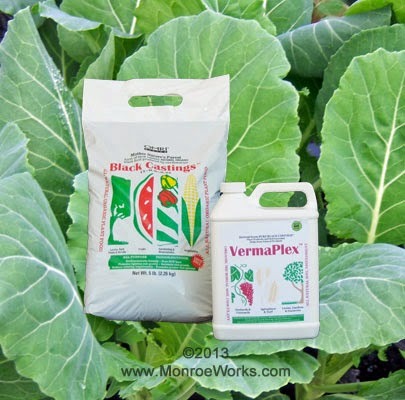 Organic Fertilizers : These are the fertilizers we add to our potting soil mix. Composting Red Worms : Join the revolution, start your own vermi-composting project. Convert your kitchen and garden waste to rich compost and fertilizer.